I only have a few minutes, but I just wanted to (very late, I know) let you know that Anniston's appointment with her cardiologist on Monday was wonderful!! Her aorta is still VERY open, and that doctor doesn't want to see her again for THREE months!! Whoohoo once again! They were amazed that Anniston looks so great and that you really cannot even tell what she has been through just by looking at her. God is good! AND, because her heart is not having to work as hard anymore, she is growing exponentially. 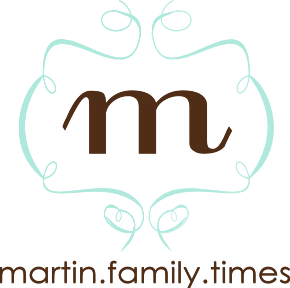 I will tell you about this growth spurt of all growth spurts in my next post. Have a great weekend! 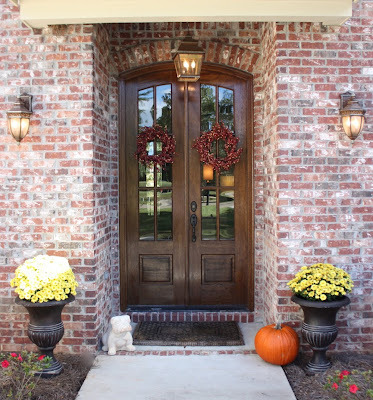 Since it's a beautiful fall day, and because I'm apparently on a roll blogging so often (for me) this week, I thought I'd join Kelly's Korner Blog and her "Show Us Your Life" series today. Well, she actually does it every Friday, but I'm pretty sure I can still link to it today *fingers crossed*. 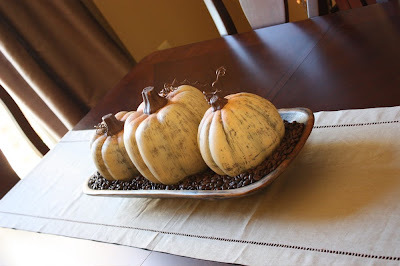 So, the theme this week for "Show Us Your Life" is fall decor. I didn't do much this year, but I'll share anyway. Coffee table. 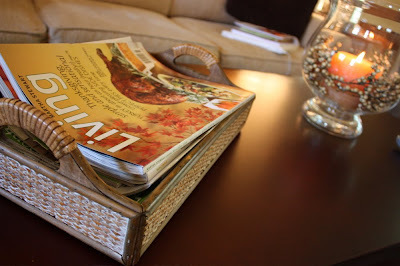 Confession: yes, the magazine is Martha Stewart, and yes, I heart her. Or, I at least heart her creations (most of them). I'm pretty sure Jesus hearts her too, so don't make fun of me too much. 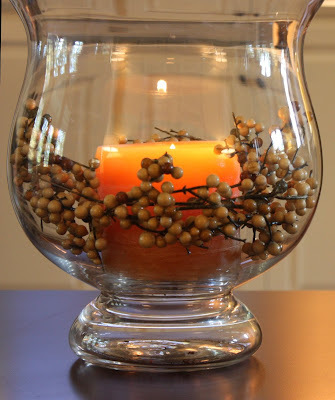 I tore apart one of my old garlands and threw the berries in here with a candle. Quick fix. I'm not in love with this centerpiece for our table, but it's fine for now. 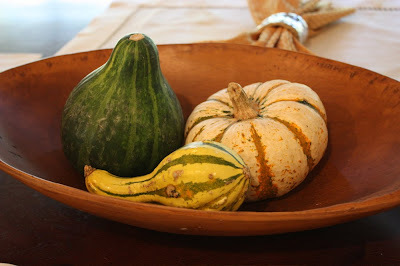 My mom brought me these gourds yesterday...love them. 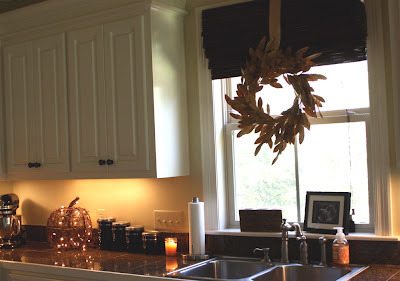 For some reason, the wreath above the window makes me smile. 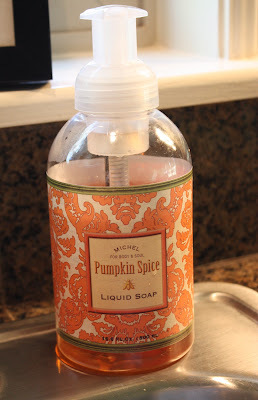 As does my pumpkin soap from TJ Maxx. 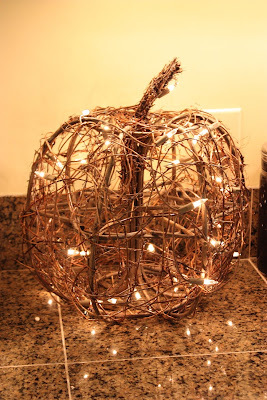 But, my favorite fall decoration of all is probably this little twiggy pumpkin with twinkle lights. The end. 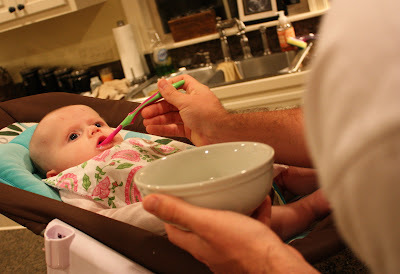 Eat rice cereal for the first time!! Move to size two diapers - finally. Go up to a full dose of infant Tylenol when needed :). ...rarely have to give it to her, but big deal to me either way. Bust out of all of her smaller baby clothes and move to size 3-6 and 6 month clothes! She grew up right before my eyes. All in one day. We went to the pediatrician yesterday for her 4 month check-up and shots, and Anniston's doctor said that in almost 30 years of being a pediatrician, Anniston was the second child he's ever seen that has had a stroke. Can you believe that?? It hit me like a ton of bricks. Our pediatrician isn't just any pediatrician. He's probably the most popular one in our town and in South Mississippi for that matter. Everyone I know goes to him, and he is very highly acclaimed. I guess it was just a matter of time, but everything from the last two weeks (and really the last several months) became very real to me in that moment. These kinds of things happen to other people...not us. Or, at least that's what I thought. But, in a weird way, I'm kind of glad to travel this road because I get to tell you what God has done. Just a week and a day ago, we brought home a baby that seemed like a newborn. She could not support her head at all, and I didn't even know if she could see me, but now she is almost entirely back to her normal self and doing all of these big girl things that you see above. We have a check-up Monday with Anniston's doctor in Jackson (praying still for a great report), and yesterday her pediatrician said he knows "those doctors are going to be very impressed with the progress she has made." I'll leave you with another video. This is a clip of Anniston completing her first rice cereal experience. I'm sure you can tell she was getting pretty tired and full, but I still think it's cute. In my defense: the clucking noises you hear are because Stan doesn't like for me to talk when he's videotaping Anniston...you know, since she talks enough for the both of us :). Here's a little glimpse of how great Anniston is doing! As you can see, she is moving her right side very well, looking to the right, and she even started talking and chewing her fingers again the other day. Woohoo!! I think it would be an understatement to say that we have had an eventful week. But, can I just say that God is good and faithful and sovereign?! While Anniston's heart cath was extremely successful with regard to her heart, the events that transpired thereafter were a bit of a shock. She's doing great now, but to make a long story short: Anniston had a stroke due to her "outpatient" procedure and we just returned home from the hospital yesterday. Okay, to make the short story slightly longer: After Anniston's heart cath, she was extremely sleepy because of the sedative she was given before and during the procedure. We stayed overnight in the hospital, as previously planned, so that the sedative could wear off and so that she could be monitored as she woke up. (No complications were ever expected; they just like for babies to stay overnight sometimes.) 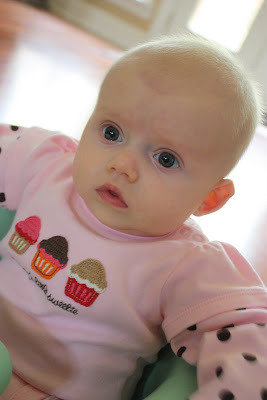 As she began to rouse, we noticed several things that seemed different about her, such as her right side being limp, but each of the symptoms we noticed were attributed by the doctors and nurses to the medicine she had been given during the procedure. At noon on Friday, when we were reluctantly preparing to leave the hospital (she was still very limp), Anniston began having a seizure. I cannot tell you how scared I was when a dozen doctors and nurses charged into the room, speculating out loud what must be happening to our sweet baby girl. I just sat in the corner of the room beside Stan with my hand over my mouth and my mind in shock. Anniston was rushed to the pediatric ICU where she had one especially wonderful nurse [you know who you are :)], and her doctor returned to tell us the news that our child had had a major stroke either during or shortly after her procedure, which caused her to seize. It had been 24 hours since the cath. I won't divulge the thoughts that went through my head in that moment, but I will say that I was more than slightly concerned. The story is longer, and we had some other worrisome moments, but I will not bore you with all of the details. I want to get to the good part: Anniston is almost completely 100% back to how she was before her procedure! She is still weak, and we are praying specifically for certain issues, but we know without a shadow of a doubt that God has done a miraculous work in her little body, and we HAVE to once again give Him praise. He has been teaching me daily through this experience. I have SO much to learn, but I am grateful that God is speaking that I need to be thankful in EVERY circumstance and that I need to be "prayed-up" BEFORE something like this happens so that I can stand instead of allowing Satan to fill my mind with worry. To completely and whole-heartedly trust. I will have to elaborate more later on these topics so as to not make a novel out of this post. Anniston has been moving her right side and looking to her right more and more. She even gave me a glimmer of a smile today and sat and stood with support. I just want to cry when I think of how far she has come in a week. Yes, God is good. Anniston's procedure went amazingly well, and in her doctor's own words, her heart looks "SPECTACULAR!" Seriously, he stopped us in the hall after her procedure but before they did an ultrasound on her heart, and he said that the narrowing in the heart usually doesn't look much better after a catheterization, but it typically improves over time. (He just wanted to prepare us before they did the ultrasound.) WELL, he just came in the room after looking at the results and said that her heart looks absolutely beautiful and that he never DREAMED it could have looked so good!!! We told him we had been praying, and he said "your prayers were answered!" God has been reminding me today of the Beth Moore Bible Study on the book of Daniel that I'm doing with some girlfriends. The study yesterday was about how Daniel stopped everything and praised God when his prayer was answered. Beth goes on to talk about how so often when God has answered our prayers, we just jump on over to the next request without truly putting everything on hold and praising Him for what he has just done. I know that I fail in this area often (I did today), and I want to be more conscious about giving God the glory He deserves. So, right now, I just want to stop everything and PRAISE Him for this miracle!! Thank you Lord for hearing our petitions and for healing Anniston completely! Thank you once again for all of your prayers. Stan and I love you guys more than you could possibly know! We have a prayer request for Anniston. A few weeks ago, we took her for a check-up with her cardiologist in Jackson, and the doctor noticed that Anniston's aorta has narrowed a good bit since her surgery. This Thursday at 8am, she will have an outpatient procedure (not surgery) called a heart catheterization where a thin, long tube will be inserted into her upper leg (the femoral artery) and will travel all the way up to her heart so that a balloon can be dilated in her aorta to open up the portion of her aortic arch that has narrowed. The balloon will then be removed, and we are praying that the aorta will remain open and that there will be no further narrowing in the future! Now, I have debated sharing this with you guys because I do not want any unnecessary worrying to take place. She really is doing great, and this request is not nearly as big of a hurdle as her surgery was, BUT do I want you to know what is going on because so many of you have been faithful to pray for Anniston with a fervency I never expected on her behalf (and on behalf of our entire family, for that matter). Thank you again for that. From the bottom of my heart...thank you. There are once again so many things that we HAVE to give God the glory for in this situation. Anniston is eating beautifully! She has gained weight very well...don't get me wrong, she's still a pretty small girl, but her cardiologist was VERY pleased with her weight gain, especially considering the fact that her heart has had to pump harder with the narrowing which, according to her doctor, would cause her to burn more calories. God is good!! She smiles all the time and plays and kicks much harder than you would expect. And, from the beginning, her doctors have ALWAYS said that she "clinically looks great." We have a healthy girl! Thank you for praying for a successful procedure and for continued peace (and no worry!) for me and Stan. *Also, my mom's having an outpatient procedure on her shoulder tomorrow, and I know she would greatly appreciate your prayers as well :).